Saint Margaret Mary Parish in Algonquin is one of the oldest settlements along the Fox River in McHenry County, with missionaries conducting Catholic services as early as 1845. Father Joseph M. Lonergan, founder of several parishes, including SS. Peter and Paul at Cary, organized Saint Margaret Mary Parish in 1915. The faith community inquired about property to build a church and Father bought the land along the banks of the Fox River just below the dam by the creek (Harrison between Water) from Mrs. F. J. Kelahan in 1914 for a nominal price. The Church was a “Greek Revival” edifice build of brick. The cornerstone was laid on July 11, 1915. 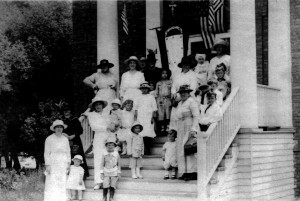 Nearly three thousand people attended ceremony, of whom about one-half were Chicago friends and patrons of the Parish. The Bohemian Catholic Societies, Knights of Columbus and the Ladies’ Auxiliaries had charge of the celebration. The Solemn Dedication took place on Thanksgiving Day, November 25, 1915, by Rt. Reverend Peter J. Muldoon, D.D., Bishop of Rockford. The mission had twenty six families. In the 1940’s, the parish was expanded by the creation of such subdivisions as Lake in the Hills, Haeger’s Bend, Riverview, Camp Algonquin, Algonquin Shores, and others. In June of 1954, Bishop Raymond P. Hillinger appointed Father Raymond N. Eipers as the first resident pastor in Algonquin, and on July 6, 1954 the corporation name was changed to Saint Margaret Church of Algonquin. One of Father Eipers’ first decisions as pastor was the purchase of a building for use as a rectory. The first rectory was located at 213 La Fox River Drive. The small mission Church built in 1915 had long been inadequate in size, and Father Eipers was authorized in 1955 to purchase a 10-acre plot for a future parish center. 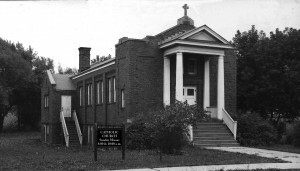 The land, located on Algonquin Road and Hubbard Street, one block east of the river, was to be the site of a combination School and Church building and the original farm house was renovated for use as a convent, with a total parish expenditure of $159,000.00. With the Dominican Sisters of Springfield in charge, the school opened in September 1955, with 130 pupils in its first four grades and Sister Mary Estelle as the Principal. One grade was added each year so that by 1957 the enrollment for six grades was over 200 students and three Dominican Sister of Springfield and one lay teacher comprised the staff of the school. The old mission church was abandoned as a church and the congregation moved for a short time into the upper level of the Church/School building and then into a basement Church on March 9, 1958. The old mission church was converted into four additional classrooms, and was used by the parish during the 1960’s. In 1969, Father Joseph J. Reikas was appointed the fourth pastor, and the school entered into share time instruction with the public district. Middle school students would travel to Algonquin Middle School for half-day sessions five times a week for courses in mathematics, earth science, history, industrial arts or home economics and physical education. That shared time instruction continued until 1983. The first of the Annual Parish Dinner Dances was held in 1976 as the country celebrated its bicentennial. Father P. William McDonnell (now Monsignor) McDonnell was named pastor on January 28, 1979, and remained for a full term of 12 years. Through the leadership of Father McDonnell, the parish began to grow in numbers and spirit. But the parish was quickly growing out of the Church, which was located in the basement of the present Ministry Center. 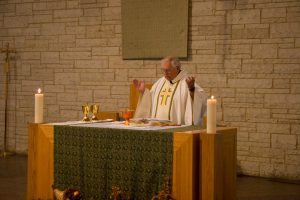 On August 28,1983, Bishop Arthur J. O’Neill, Bishop of Rockford, dedicated and blessed the new Church, Chapel, Parish Offices and Meeting Room facilities. Though the cost of the building was $1,650,000, the parish was able to pay off the costs completely within a 10-year period. In the summer of 1985, Father McDonnell led a pilgrimage of parishioners and others to the Holy Land and Rome. As they were returning, TWA Flight #847 was hijacked from the Athens Airport and forced to land in Beruit. Some of pilgrims including Father McDonnell and the women, were released. Fathers Thomas Dempsey and James McLoughlin remained hostages along with many members of the parish. The experience for the parish was both a frightening one and a spiritual one, and showed the world the strength and faith of our parish community. 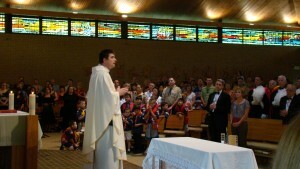 In early 1993, Father Michael Tierney (now Monsignor Tierney), was named pastor. He led the parish for 18 years, the longest tenure of any pastor to date. In the late 1990’s he began to identify a growing and strong Filipino Community within the parish, and four Filipino associates have served at Saint Margaret Mary. Also during this time, he identified a community of people of Polish decent who wished to celebrate Mass, Sacraments and devotions in the Polish language. Although they lived in the Fox Valley area, they continued to drive into the City of Chicago to go to Mass. The Divine Word Society, a Community of Priests and Brothers in Techny, Illinois came to the parish to assist with the Polish Community. This has grown to a community of over 1,000 Polish families, and we now have a Polish cultural school that teaches the children of these families both Religious Education and the history, culture, language, and geography of the Polish People and Nation. 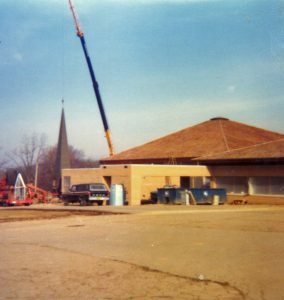 In 2002, it became clear that the growth of the parish and its children and ministries required another increase in our parish physical plant. At that time the local public school district was looking to move the local grade school and indicated they would be interested in accepting Fr. Tierney’s offer to buy the Eastview school building and property. This purchase doubled the number of classes in our Catholic Elementary School and provided additional space for the Religious Education and Youth Ministry programs, as well as for meeting space for 130 Parish ministries. The purchase price was $3,400,000, but it would have been much more had we not received an additional blessing in the gift of construction and remodeling from an anonymous donor through a Catholic Foundation. The Catholic Elementary School and the Elementary Religious Program moved into the new Education Center just after Labor Day 2003. On July 1, 2011, Father Peter Sarnicki of the Conventual Franciscans became our 12th pastor. He and his Friars now lead the flock of over 11,000 members of our parish, which is approximately 3,500 registered families. We continue to grow in families, faith, and ministry, and in 2015 we celebrated 100 years as the Catholic Church in Algonquin.